I promise to use it only to send you I Love Jersey News. Jersey is like nowhere else! Apart from being the sunniest place in the British Isles, find out all the other things that make it a unique place to visit. This is the most southerly of the Channel Islands, and lies in the Bay of Mont St Michel 161km (100m) south of mainland Britain and 23km (14m) east of the French coast. It isn't part of the United Kingdom, although it is within the British Isles, and isn't part of the EU either. Prevailing south-west winds and the Gulf Stream means that the climate is mild and slightly warmer that you would expect from the latitude. Jersey has an average of 2,000 hours of sunshine a year making it officially the sunniest place in the British Isles. The Island has its own notes and coins including £1 notes, although the currency is Stirling and English, Scottish and Guernsey money is also accepted. Jersey coins and notes are popular with collectors - and our £1 notes bring back nostalgic memories for many UK residents! The island also has its own stamps. Channel Island stamps are popular with collectors, and there are many beautiful designs. You can buy Channel Island stamps online here. Jersey became an island only about 8,000 years ago. Until then lower sea levels meant that it was joined to the French mainland. At exceptionally low tides, remains of fossilised trees can be seen sticking through the sand in St Ouen's Bay. There is evidence of people living here dating back more than a quarter of a million years. If you visit the Museum, you'll see displays and relics found at La Cotte Point showing how people hunted mammoths by chasing them over the steep cliffs! There are many ancient burial sites, dolmans, and standing stones. From 933 until 1204, the Island was ruled from Normandy. The language still spoken by some Jersey people, Jèrriais, is often called Jersey Norman-French. The division of the Island into fiefs, as well as the twelve parishes also goes back to the days of Norman feudal rule. The Islands laws are still written in French, although sittings of the States, the Island government are now conducted in English. When War broke out between King John - who was also Duke of Normandy - and France, King John lost Normandy, and the Islanders chose to break their ties with France and remain linked to the Duke. This left the Island in danger of invasion from nearby France, and so defences were built around the Island including Mont Orgueil Castle, Elizabeth Castle and the various towers around the coastline. In 1461 the French seized Mont Orgueil Castle, and ruled the Island from there for seven years. In 1781, a French expedition landed at La Rocque and marched as far as the Royal Square before they met opposition. The bravery of an English Officer, Major Pierson, during the famous Battle of Jersey, prevented the Island again being ruled by the French. 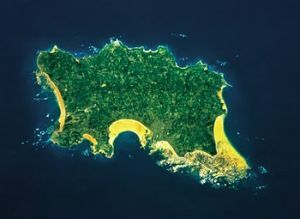 The Island was again occupied during World War II, as were the other Channel Islands. Extensive fortifications were built and can be seen all over the Island. The story of this time is told at the Jersey War Tunnels, the Channel Islands Military Museum and the Island Fortress Occupation Museum. The Occupation Tapestry was made by Islanders and depicts scenes from the occupation and Liberation of the Island. Laws passed by the States are ratified by the Queen and the Privy Council. The Lieutenant-Govenor is a member of the British Armed Forces appointed as representative of the Crown fro a five year term. The Island has a magistrate's court, but serious cases are heard in the Royal Court - presided over by the Bailiff and the 12 judges called Jurats. Each of the twelve parishes has a Parish Assembly, presided over by the Connétable or Constable. The Connétable also overseas the non-uniformed honorary police force in his parish. This means that the Island has thirteen police forces - the uniformed States police and twelve honorary police forces! You are most likely to hear the Island's unique Norman-French language called Jèrriais in St Ouen where it is still spoken by some of the older people. The language was dying out until a few years ago when optional lessons were offered in local schools. You can hear words and phrases in Jèrriais here. The majority of people living here now speak English. French is spoken by many, and taught in the schools, but you're more likely to hear Portuguese or Polish spoken by the many people who come to the Island from the continent to work. Around a tenth of people settled in the Island have Portuguese as their first language - most are from the Island of Madeira. Place names here are mostly French. Some streets in St Helier have both English and French names which mean completely different things! Jersey names can be difficult to pronounce! There is a guide to help you with the more common names here. Jersey has given it's name to cows, potatoes, knitted jumpers and to an American state! Listen to some Jèrriais here. 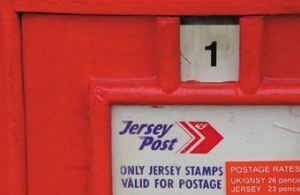 Find out how to pronounce Jersey place names here.